I feel sorry for people who have food allergies because there are some foods that they can’t enjoy or fully appreciate. No doritos. Or cheetos. Or brie cheese. NO BRIE CHEESE. I can’t recreate those in a non-dairy formula no matter how I try. However, I have found ways to make some foods at home that are pretty good substitutes for the originals – creme brulee, Bette le Mae, ranch dressing, and now – PIZZA BURGERS. Clearly life without pizza burgers is limited at the very least. I added a mixture of tomatoes, herbs, and a touch of spaghetti sauce to the top of my pizza burger – it was delicious. For an authentic pizza burger experience, serve with ketchup and a side of fries. Be sure to let the pizza burgers sit for a few minutes after you remove them from the grill. Otherwise, the cheese is too hot and oozes all over the place. 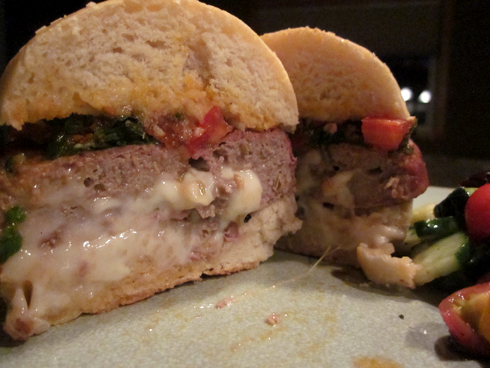 I like to cut the burger in half before eating so the cheese can start to ooze just a bit. Otherwise you run the risk of taking a bite and having the cheese slap you in the chin. No one likes to get cheese slapped. In a large bowl, mix together ground chicken and ground venison. Combine by hand until everything is well blended. In a bowl, combine gelatin and water until the gelatin dissolves. Pour gelatin mixture into a food processor; add vinegar, garlic, salt, fennel, black pepper, and paprika. Pulse until everything is mixed and the garlic and fennel are in small bits. Add spice mixture to the ground meat, mix by hand until everything is evenly coated. Cut six squares of waxed paper, about 6” in size – these will be used to flatten each patty and makes getting them to the grill much easier. Divide the meat into six even portions. Take one portion and form it into a ball. Divide it in half, place it on a square of waxed paper, and flatten it until it is about the diameter of a softball. Place four squares of cheese in the center. 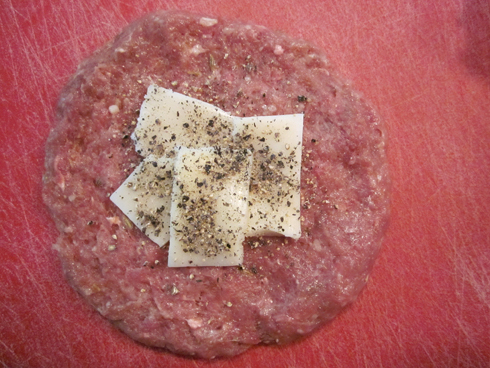 Flatten the other half of the ball into a patty and place it on top of the cheese. Press the sides together to form a seal. Repeat with the remaining patties, then refrigerate for at least one hour. In a bowl, combine the herbs, spaghetti sauce, olive oil, salt and pepper. Stir to combine. Over medium-high heat, grill the patties (waxed paper removed) for about 5-7 minutes a side, moving to a cooler part of the grill if the cheese starts to escape. Remove from grill, cover, and let sit for 5-10 minutes before serving. 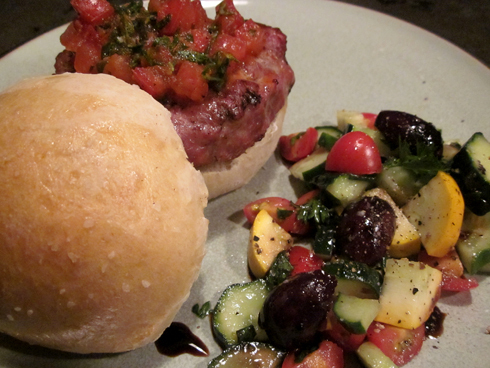 Serve each pizza burger on a bun with a scoop of the herbed sauce topping. – You can use low-moisture part skim dairy mozzarella in place on the non-dairy kind. I tried it, and it was awesome. – If you don’t have a freezer filled with ground venison like I do, you could use the lowest fat ratio ground beef in its place. – If you do have a freezer filled with ground venison like I do, better use it up, hunting season is right around the corner. – I made the buns for this recipe, and while they were tasty, they were super tall. I recommend using the flattest bun you can find to make eating a bit easier. – As with all poultry, it is very important to bring chicken to 165 degrees F in order to ensure that it is at the temperature required to eliminiate the risk of bacteria. The only way to be SURE it is at the right temperature is to use a meat thermometer. With a pizza burger, once you poke a hole in it the cheese has a place to escape. After you remove the burger from the grill and let it rest a bit, test it with the thermometer. If it is not at the safe temperature, microwave it a bit until it reaches the desired temp. Sounds and looks lovely. You’ve done a really good job with those burgers.